Another book with the theme of empowering the employee. Treat employees as partners, give them autonomoy, and provide them support, this will provide the employee with Joy at work.This title pairs well with Baake's other book, the Decision Maker, and Ricardo Semler's The Seven-Day Weekend. Subtitled “a revolutionary approach to fun on the job”, Bakke tells of his eary life in Washington state, learning of the world of work, how the age-old boss-worker demarcation is still alive and well, despite the fact that it squanders most of the potential contribution of the worker. He is concerned that the focus on leaders has lost sight of the fact that everyone can and should contribute to the organization. Bakke had been a capitalist as a child, raising steers, spent some time in government as well. Seeing the primary goal of any organization to be one of stewardship, giving back to the community and society (he is not that convinced that this mission should belong only to “not for profits”), he founded an energy company, AES, that had four abiding principles: fun, fairness, integrity and social responsibility. This book has exceptional detail on how the company was structured. Using what he calls the “honeycomb” structure -- decentralized, where the CEO is no more than 3-5 levels from anyone in the company, Bakke and his associates sought to drive the decision-making (performance reviews, budgets, planning, etc.) as far down in the organization as possible. In some cases he was even able to remove the exempt/nonexempt delineation, making everyone salaried (this required some machinations to ensure compliance with government regulations. They even met with President Clinton and others to discuss changes in employment law, which never happened). This structure was introduced in other countries and cultures as well.Bakke is quite honest in telling the tale, sharing his failures as well as his successes. Indeed, the company has gone through some significant struggles, losing stock value (he argues that using stock value as the measure of success is a poor yardstick, much more important to focus on his four themes of fun, fairness, integrity and social responsibility), causing some board members to suggest that aes “back off” a bit on their values and commitment to fun. Bakke resolutely refused. A deeply spiritual man (although very careful not to impose his beliefs on others), he says that companies that use these principles merely to make more money are doing a disservice to all involved. Following these principles is a reward in itself, says Bakke. According to him, the primary function of profit should be to keep the business going to provide affordable power to more and more people. As a result of the company’s foundering stock, he was eventually convinced to “retire’ (he has a foundation, a graduate school, etc.) and write this book.As an evangelical Christian, Bakke ends the book with an exceptional postscript, “Enter into the Master’s joy”, that uses Jesus’ parable of the talents as well as the stories of Joseph, Daniel and others to challenge the sacred/secular distinction that the church and business seem to promote. According to Bakke, if Joseph was in a modern-day church, he would have been encouraged to quit his “job” as #2 man in Egypt to become a full time Christian leader, something he already was, with more impact that if he had left! Bakke talks of the language used now to describe work as ministry, including lifestyle evangelism, marketplace ministry, and others, challenging them (although not damning them) as not really demonstrating what the Scriptures really teaches about work. This extraordinary book ends with a basic timeline of the AES story, as well as an extensive comparison of the conventional approach vs. the joy at work approach (side by side comparisons and contrasts of treatment of employees, purpose/mission/goals, leaders, etc.) He also provides an extensive bibliography and some some other study guides and resources from “Joy at WorK’ as well as other books. 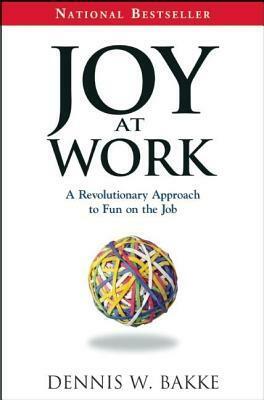 "Joy at Work" was on Joel Gascoigne's reading list. Joel leads a company called Buffer and is leading with clear principles, setting a great example for many leaders. As I was reading "Joy at Work," I could see why this book was on Joel's reading list.Dennis Bakke is a trailblazing leader as well. Using the principle of what it takes to bring joy to work drove the growth of his business. Part of the conclusion he reached is that bringing joy means people want to make decisions and be held accountable for them. Being held accountable means learning from mistakes and not making them again. With clarity of principle, Dennis led the organization to decentralize as much as possible. This is a real story with real challenges. When the economy tanked, the Board and markets were calling for centralization. How Dennis navigated this is inspiring and frustrating. Inspiring in how he kept to his principles and frustrating in how he could not really break through the mindsets.Read this book to see how a principle of joy can change your leadership ways. Read to learn from the challenges and successes encountered. An interesting book about what Dennis Bakke had in mind when founding and leading AES. Most of the time it is more of a personal story, but sometimes there are these jewels giving more insight on how AES worked at that time and what the concepts were, what worked and what didn't. Dennis Bakke writes for example that he wanted that everyone in his organization has "Joy at work". Therefore responsibilities and decision making was shifted downwards to the experts with the appropriate knowledge. A lot of people liked that, it motivated them and so they had more "Joy at work". But he also mentioned that there were people who could not cope with that (something which is often neglected in books about self-organizing teams and empowering employees) and which did not fit into the concept of AES. Great story, truly affirms the importance of work and work-faith integration. Takes a helpful core insight - that joy at work comes being treated as a partner, not an employee, knowing that your work and contributions really matter, and having autonomy to make your own decisions, with advice but not necessarily permission from others. Detailed expression is really specific: encourage high ownership of all workers, treat them as partners, have 80% of people's jobs be on their specific jobs and 20% on broad work that benefits the whole company, make pay transparent, eliminate HR, etc. Interesting thoughts, but may not all be universal. There's some interesting stuff in here, particularly the story of AES and Bakke's key message about not allowing 'joy' to be directly linked to financial bottom line. i.e. The goal of creating a joyful workplace should persist regardless of whether the company is in tough financial times.A simple read, if perhaps a little too long, and I skipped the final section which becomes quite focused on the balance between 'serving' from a Christian perspective and how this relates to work. But the rest of the book isn't too focused on the religious element. Anna Fan was reading this and encouraged me to read it. I appreciate Dennis Bakke's perspective on vocation and calling. It reminded me of how Kevin Offner used to hold, "Ordination Ceremonies" into everyday life for IVCF grad students, and how the church must value marketplace ministry more. Are leaders willing to teach? Are workers willing to take initiative and responsibility?